Easy to install and use, this high quality “plug and play” typing foot pedal is one of two recommended foot pedals used by many Pacific Transcription typists. 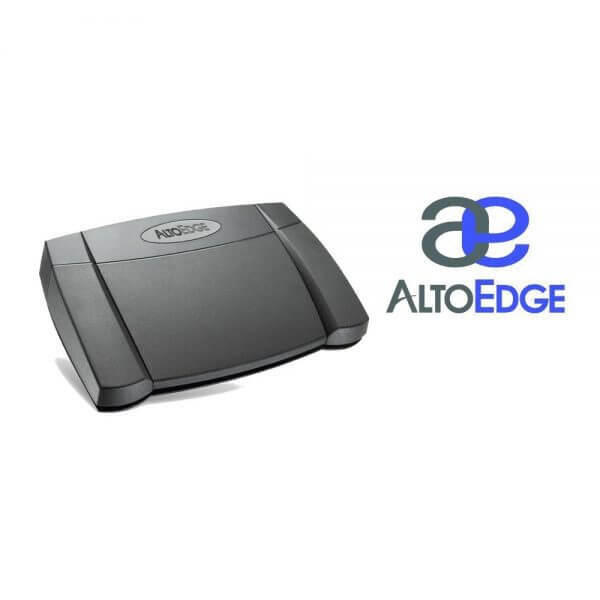 The Alto Edge Typing foot pedal is available for USB connections, and connects to your Windows PC or Mac OS X computer. It has three controls which are usually set up for rewind (right), play/pause (centre) and fast-forward (left). Pacific recommends Express Scribe Pro Transcription software to drive this foot pedal. The Alto Edge Foot Pedal is compatible with many transcription software, including NCH’s Express Scribe Professional transcription software, also available from Pacific Transcription. Alto Edge foot pedal – Three-button USB foot pedal makes transcribing fast and efficient, High quality ergonomic device, Works on PC and Mac, Designed for use with Express Scribe Transcription Software, Anti-slip backing, Weighs 1.04kg/2.3lbs. System Requirements: Windows XP/Vista/7 and Windows 8, Works on Mac OS X 10.4 or later, 1 Free USB port(1.0 or higher).